EVERY WRITER walks the line between the engaged and the detached—scientists turned writers, most of all. Kay Redfield Jamison is a professor of psychiatry and an honorary professor of English at the University of St. Andrews in Scotland. 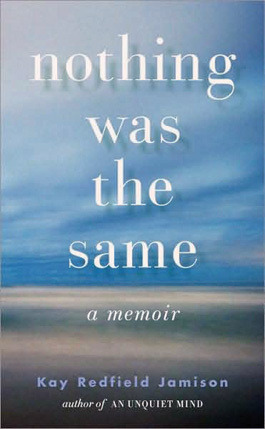 In her memoir Nothing Was the Same, she writes with delicate lucidity about her marriage to Dr. Richard Wyatt, a prominent medical warrior against schizophrenia. As Jamison's previous book An Unquiet Mind tells, she herself is afflicted with manic depression; moreover, she wrote the standard textbook on bipolar illness. Her marriage was harmonious from both the point of love and career; it was Wyatt who encouraged Jamison to take the great risk of writing about her own illness. When Wyatt succumbed to cancer—a disease he'd fought since his youth—Jamison had to find her own way back through grief. The clinician and the poet in Jamison harmonize in describing this halting journey. Jamison's plain but never guarded prose makes every page of this memoir fresh and accessible. One notes their delight in simple things. She writes of her and her husband's love of the TV series Alf, of the flowers and jewels he brought her, of the care he took watching over her, to make sure hard work and too many late nights didn't open her up to her disease. This is a slim yet profound book, unadorned by fatuous spirituality, by a writer eager neither to conceal nor exaggerate her feelings. It gives grieving its complete due, and at the same time there's nothing at all depressing about it. TWENTY-FIVE artists take readers on a charter ride on Le Bateau Ivre in Drunk: A Comic About Bar Stories, a small-press, limited-edition book. Reprints include Ivan Brunetti's keen itty-bitty bestiary of beastly drunks, and his two-page autobiographical story of extreme self-loathing—extreme even by the standards of adult comics, which means five floors below Dostoevsky's underground. Five fine reprinted pages by Kim Deitch feature Waldo the Cat, megrim of a drunk and disorderly pioneering animator disgusted by the cuteness of the animation world of the 1930s. Some of the most bizarre outsider art ever seen is the drawings of Norman Pettingill, full of visions of North Woods revelry: crowded bucket-of-blood taverns where grimacing taxidermed animals giving the eye to huge-bottomed hags. Jay Pink's scary narrative of drinkers he has known includes a confession to being accessory after the fact in one drunken murder—fiction, hopefully. Evan Dent's "Hot Dog Millionaire" illustrates a low-ball dirty joke, of the sort people enjoy when they're in their cups. What makes it stick, though, is not the vile story, but Dent's strange figures—humanoid dogs or bears, devoid of fur and of any touch of cuteness. Jay Bailey, Chad Brown, Sean Russell and Erin Stellmon take the smart road of reporting the strange dialogue one might here anywhere the neon glows and the drunkards ramble. The introduction is by renowned Las Vegas tavernaut Jarrett Keane.